Transporting groceries from the store to the fridge has become a millennial conundrum for anyone who eats food. Ideally we BYO-bag and we remember to bring them every time we go grocery shopping. However, this is not always the case. Since the introduction of the BYO-bag concept we now all have a collection of reusable bags in the trunks of our cars, at our front doors (generally a reusable bag full of other reusable bags on a hook), sometimes we even have one or two in our desk drawer at work. But do we remember to bring them with us? Not always! This leaves us with a big decision at the check-out counter. From a retailer’s perspective, this is also a conundrum. How do we best serve our customers and help them get their groceries home safely while at the same time offering something eco-conscious? Let’s face it, single use grocery bags are convenient but not exactly earth friendly. Charge for plastic bags to encourage BYO-bag and donate the revenue to a local environmental organization. Offer free boxes at check-out. Sell a variety of reusable bags. Our latest decision is to replace plastic bags with paper bags. Through a recommendation from our Environmental Committee the co-op membership voted to switch to a 100% recycled, U.S. made, Fair Trade certified, biodegradable and recyclable paper bag. In a nutshell, plastic wreaks havoc on our environment. It takes years to break down and in the meantime ends up in our waterways, our trees, consumed by wildlife and leaches chemicals. Until BYO-bag becomes a real habit for shoppers, we choose to provide you with paper bags when you forget (or you don’t have enough pocket space)! Why have you decided to switch to paper bags? This Big Carrot is committed to protecting the environment. Banning plastic bags is a step towards to protecting our oceans and landfills and we hope that the City of Toronto makes a step to ban plastic bags as many major cities in the world already have. Examples – San Francisco, Los Angeles, Portland, Mexico City, Delhi, Rwanda,and more! Wood scraps undergo a process known as biodegradation when they’re buried, which is a fancy way of saying they’re transformed by bacteria in the soil into other useful compounds. Plastic also degrades but what’s left is small bits of toxic plastic that contain bisphenol A (BPA) and PS oligomer. These bits never go away and contaminate our water supply and ecosystems. Paper bags are made from trees, how is the helping the environment? We have sourced a company who produces our paper bags from 100% post consumer, unbleached, recycled paper fibre. They are biodegradable and recyclable. Paper bags that are made from post consumer materials and are recyclable use less energy to produce and to recycle than a plastic bag. No, They are made in a US factory that pays fair wages and provides a safe work environment. In fact, they are FairTrade certified! Why are your bags so expensive? 10¢ is our cost price. 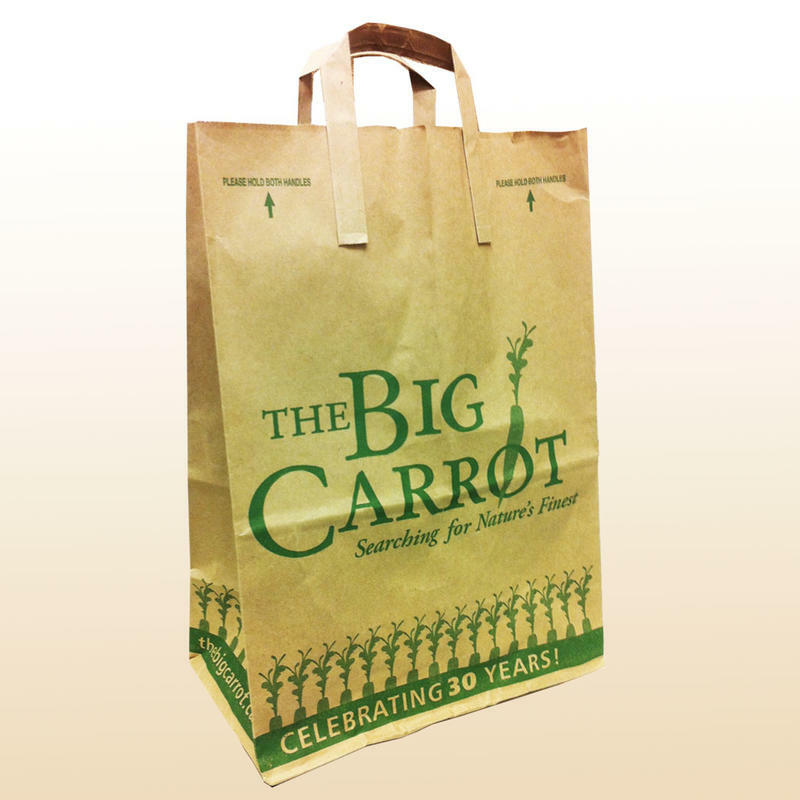 The Big Carrot will always charge for bags as an incentive for people to bring their own reusable bag. Are you donating a portion of the money to charity? We have opted to implement a reward program for shopping with reusable bags instead of giving to charities. 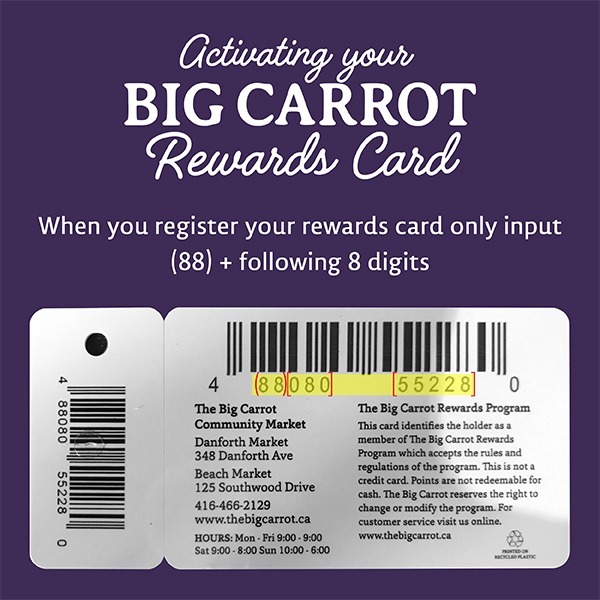 Look out for the Big Carrot Rewards Card, coming very soon! What about biodegradable bags ? The City Toronto bylaw 356-2009 (Municipal Code Chapter 604- In Store Packaging By-Law) prevents us from offering bio-bags at the check out . Please contact the City Info -311 for more information on this bylaw. I don’t want to pay for double bags or more than one bag to hold my groceries, fill it up! The Big Carrot will a have a grace period (until the end of June) to accommodate double bags during our transition. How much weight can the paper bags hold? The bag can hold 5-7 lbs if you use the handle and do not pull the handles out during transportation. The bag can hold up to 20 lbs if you hold it from the bottom. We do not recommend overloading the bags. We encourage cotton bags or nylon, cardboard boxes and car bins for heavy loads.